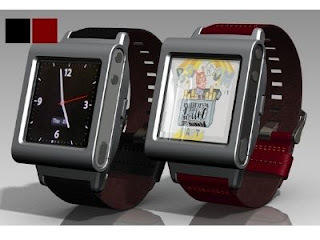 The concepts of bracelets designed to transform the iPod Nano in a watch design are not new. Currently, nearly two dozen bracelets are available on the market. Chrys Coball Dom and his wife plan to increase supply and promising enough to launch a range of watch straps for the player. This range is becoming known Deckster. According to the Canadian couple, their products greatly renewed design. For them, marries Deckster appearance, functionality and reliability. We will be entitled to three types of bracelets: bracelets are dressed First Class, available in black and red. The shell of the player displays a silver color. Funky bracelets Class have a pattern foot-hole, with a shell inturquoise or yellow. Finally, the Night Class bracelets are 100% black or purple. The straps are all leather and aluminum hulls. Chrys and Dom Coball are currently fund raising on the site CKIE to fund their project. Their interest in watches, fashion and music led them to conceive Deckster.